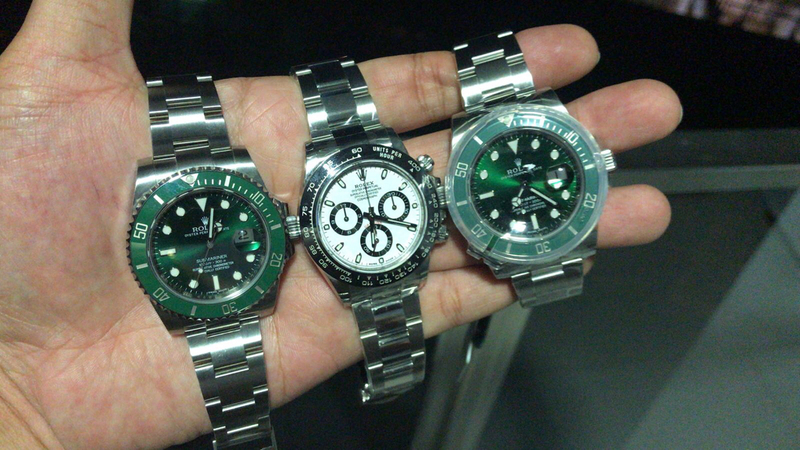 Rolex Submariner Hulk ref. 116610LV. Our Favorite Sub at the Moment. The Rolex Submariner Date ref. 116610LV a.k.a 'The Hulk' is yet another one of those pieces that has something special that made us gravitate back into the brand. Without a doubt, the Rolex Submariner is one of the five most iconic watches in the world and one that after more than 60 years from its launch —originally launched in 1953—, keeps getting better and better. Fitted with a 40 mm stainless steel case and a striking green dial and green cerachrom bezel, the Rolex Submariner Date ref. 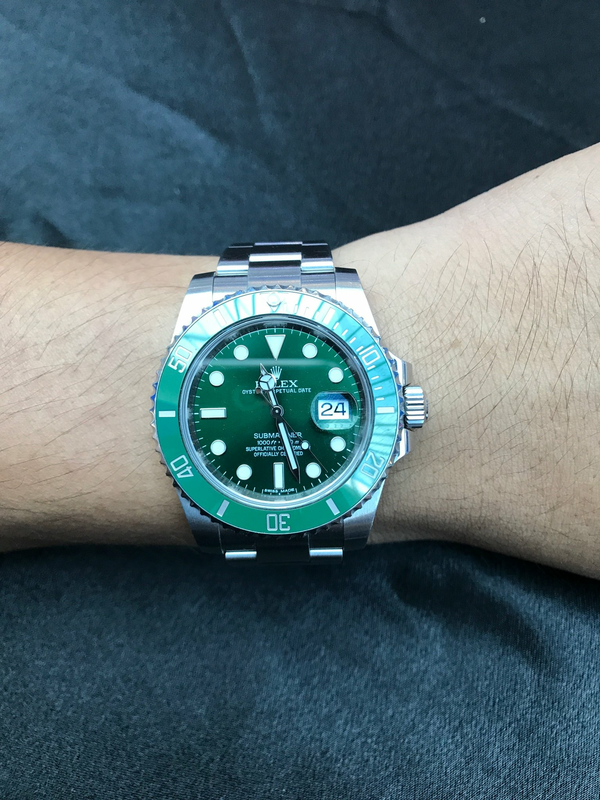 116610LV a.k.a 'The Hulk' is one of those special Rolexes that you rarely see in the wild and that seven years after its launch in 2010, is still making waves and getting people excited. The Rolex Submariner Date ref. 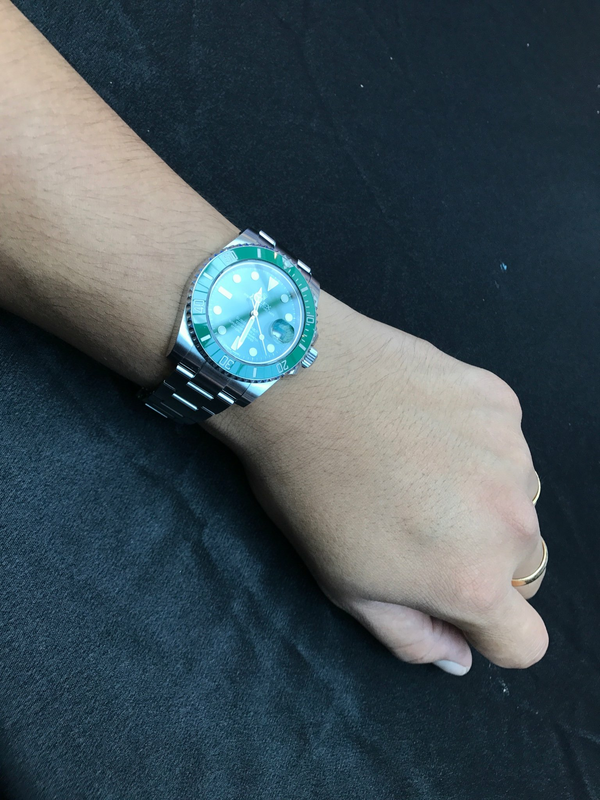 116610LV a.k.a 'The Hulk' is fitted with a green maxi dial with bold markers in 18K white gold. This dial, is a true chameleon that varies in hue all the way from a very dark green color —almost black—, to a nice bright 'Kelly green' when exposed to bright light or under a sunny day. 'The Hulk', is also fitted with a green graduated bezel made of Rolex's proprietary cerachrom. The bezel is easy to use and perfectly suited for all sorts of diving, its color is more 'milky' and slightly lighter than the dial. The cerachrom bezel is initially made of white zirconium dioxide powder and then mixed with pigments that give it the desired final color —in this case green. The resulting paste is shaped by a high-pressure molding machine that creates a blank bezel. After several firings at temperatures exceeding 1,500 degrees Celsius, the bezel hardens and reveals its final color. A third step involves precision machining using diamond tools to cut graduation hashmarks and numerals on the bezel and give the bezel its final shape and size. Afterwards, the full bezel is coated with a thin layer of platinum via a PVD process —Physical Vapor Deposition— in order to fill the engraved numerals and graduations. Lastly, diamond polishing removes the platinum from the bezel surface, while the platinum coating on the numerals and graduations remains. This last step is what gives the cerachrom bezels its extremely lustrous appearance. A big difference between the Rolex Submariner Date ref. 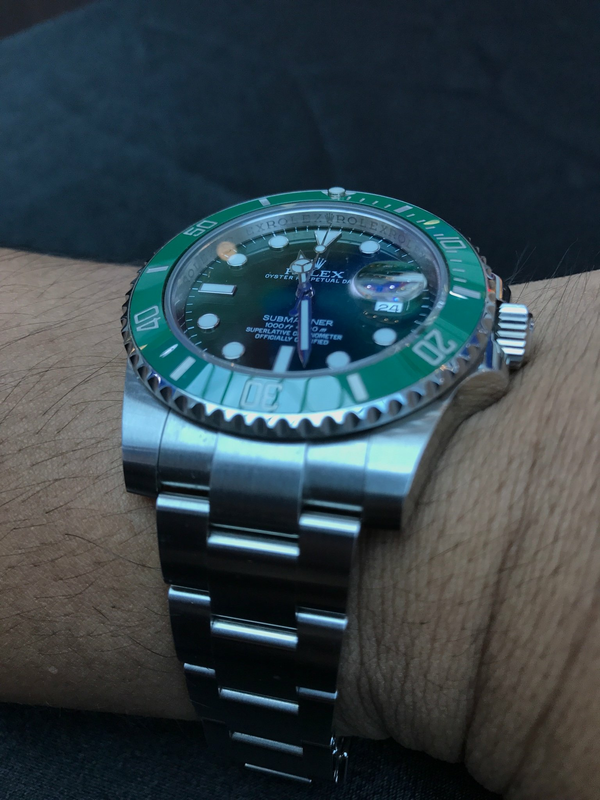 116610LV a.k.a 'The Hulk' and other Rolex sports models like the GMT Master for instance, is the lack of polished center links on its Oyster bracelet. A nuance that makes a lot of sense since you might not want to scratch the center links while putting on your diving gear or getting too close to corals while diving. 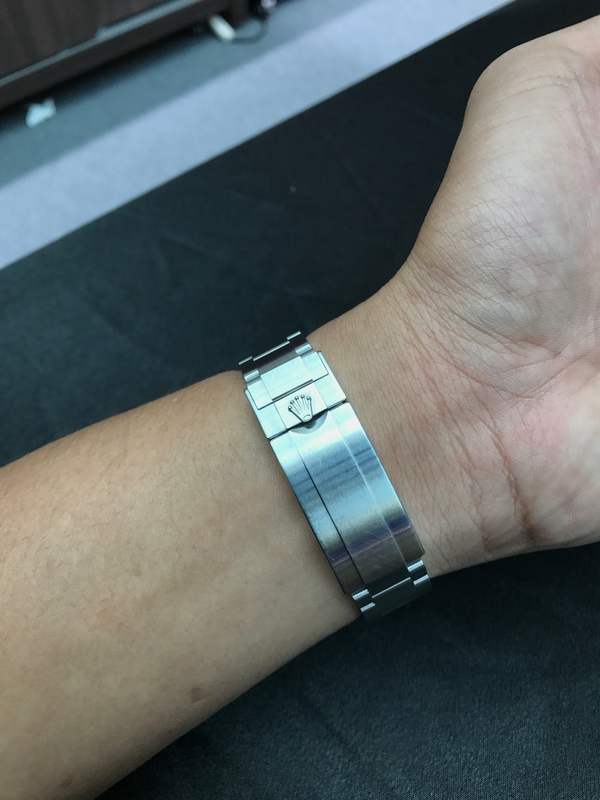 The bracelet, is of very solid construction and is fitted with an Oysterlock clasp to prevent accidental opening and a Glidelock system that allows for the watch to be worn comfortably over a diving suit. The Rolex Submariner Date ref. 116610LV a.k.a 'The Hulk' is powered by the Rolex automatic in-house calibre 3135. This movement entirely developed and manufactured by Rolex is one of the most robust and accurate calibres out there. The calibre 3135 is fitted with a Paramagnetic blue Parachrom hairspring. Like all Rolex Perpetual movements, the 3135 is a certified Swiss chronometer, a designation reserved for high-precision watches that have successfully passed the Swiss Official Chronometer Testing Institute —COSC— tests. The watch is water resistant to 300 meters. On the wrist, the watch wears true to its size and extremely comfortably. A beautiful watch with unparalleled wrist presence that you will hardly spot on the wild —unlike the regular Rolex Submariner Date ref. 116610LN with black bezel that everyone and their mother wear everywhere. Great stuff mate! Thanks for sharing. This is an amazing timepiece. Isn't that the amazing power of hype? Nobody wanted this watch when it was released and people who bought were selling it off quickly at low prices citing bad luck etc etc..
Fast forward a few years and suddenly it's going to be discontinued and price shoots up? The same thing happen on Paul Newman Daytona. It’s a hard selling model backs to 1970s. Now is totally different story. Lol. Latest price is already 50k. Can it go any higher? just wonder how much is the price at AD (new) now? Never sell this watch, the value will only up not down. You know why? because Rolex Logo is green and this beast represent the brand. Rm56k now... looks like soon going to break 60k mark. Hottest watch in the market, this watch is crazy! Price is almost 59K now for brand new, definitely must have one in the collection. Try your luck at AD in the airports, my friend got it with retail price at AD in Amsterdam!